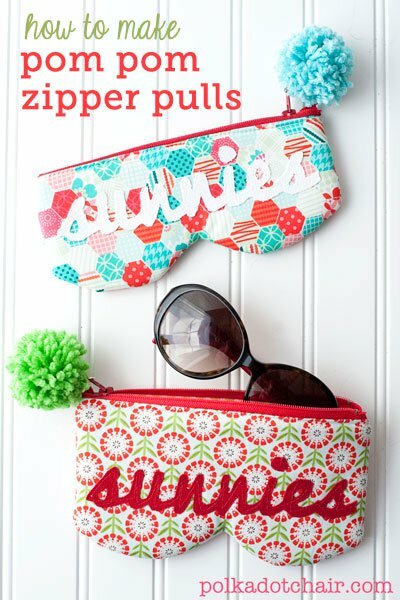 Five Things Friday: Sunglasses Cases | Keeps Me Out Of Mischief! Spring appears to have finally sprung; well it’s been sunny for at least two days this week so I’m hopeful that the cold weather has gone and the sunshine is here to stay! I’ve had to dig out my sunglasses so that I can actually drive to work. Easier said than done hen the last time you saw them was in a completely different house before they got put in a box ready to move. It would have probably been easier to find them if they weren’t in a dull, navy blue, plastic case. Here’s some inspiration for some crafty cases that would have been easier to find in dark, dark boxes (that I really must get around to unpacking!). 1. Positively Splendid has a tutorial for this ruffled case. Perfect for using up your material stash. 2. Polka Dot Chair has a tutorial for this zipped case with pom-pom. You’d definitely be able to find them in your bag with a pom pom hanging off them! 3. Kateschmate has this owl design. I think I’d have to tone down the colours! 4. 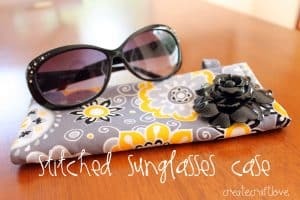 Create, Craft, Love has this sunglasses case, I love the fabric! 5. Samanthajday has this cross stitch version – perfect if you keep putting your glasses down in odd places like me! « Quick, I need chocolate!